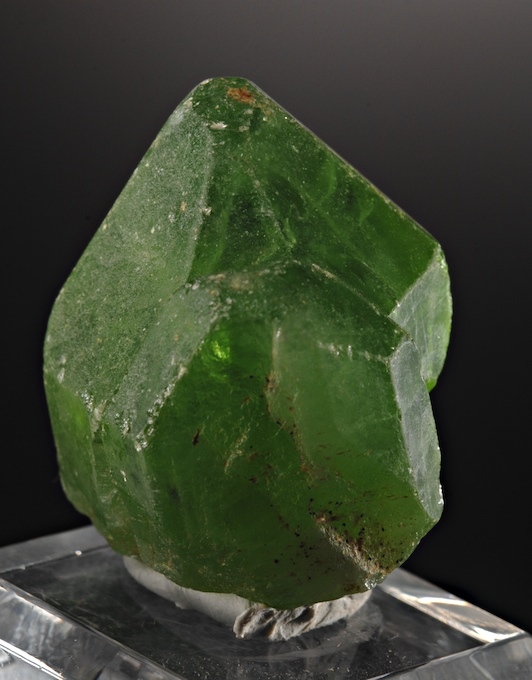 A big, hefty (46 grams) compound Peridot crystal with fine color and facet grade interior. Typical of crystals that reach this size there are several areas of edgewear and rounding of corners. The overall form is fairly good and this is an above average quality specimen from this area, vintage 1990's. 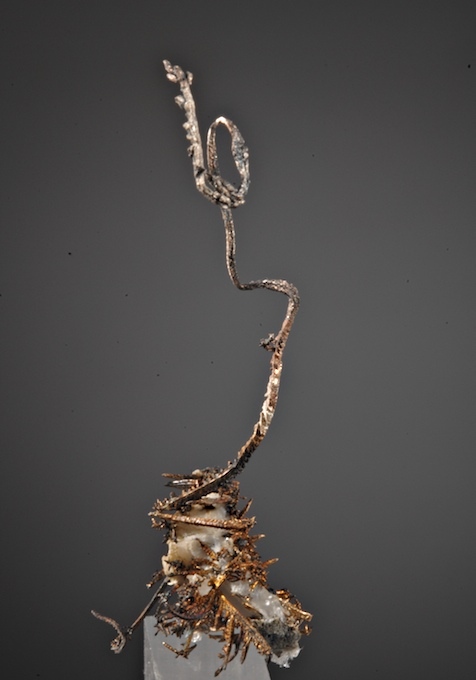 A delicate, elegantly formed Silver wire rising from a nest of smaller wires and and Calcite in an esthetic form. Close examination shows perfect tiny crystals of Silver in dendritic, spinel twin and "herringbone" habits on all the wires. From the Batopilas area which is a modern classic locale, this shows well many of the unique habits that are distinctive from here. 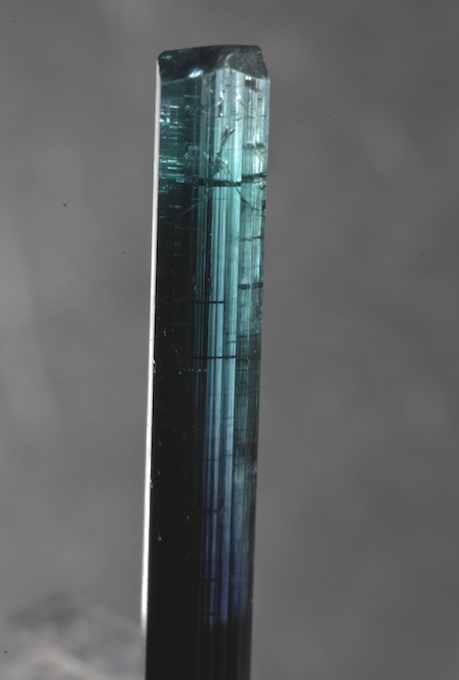 From a find in the late 1990's this is a zoned "catseye" Tourmaline with gem clear green termination. 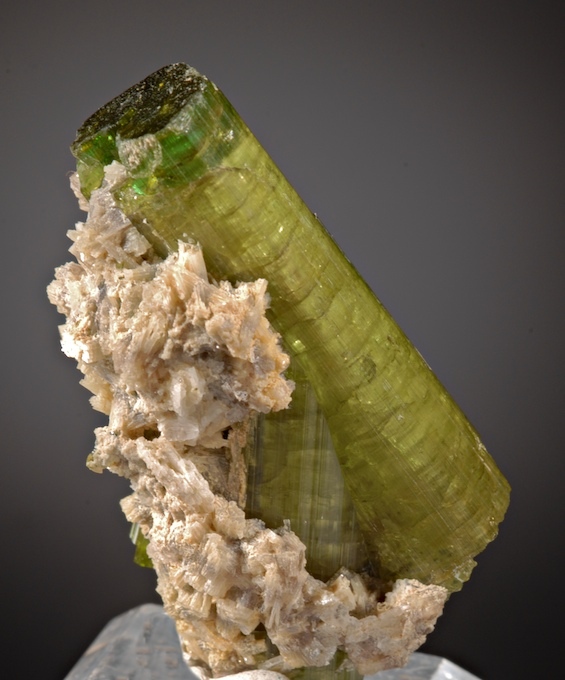 The bottom termination of the main crystal shows the hollow interior with fine fibrous Elbaite that gives the catseye effect. Very attractive and nicely composed the condition is very good, in the photos most of what may look like chipping is small contacts that show some recrystallization. 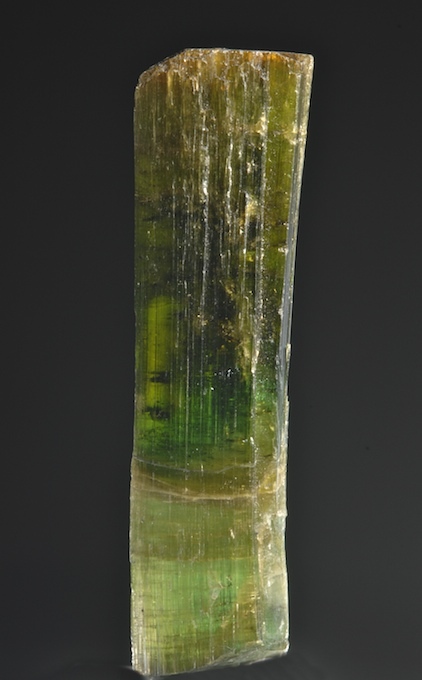 A good value with a main 5.8 cm Tourmaline well presented. A darker bottle green Tourmaline with a subtle curve, color gradation and complete termination. 34.5 Grams in heft, there is an area of fibrous (cats eye) crystal in the curve zone where this crystal has had some natural breaks and rehealing. There is one repair at that point as well. A good, sizable, affordable crystal from a famed locale in good condition as seen. Outstanding deep grape purple color in large gem-clear phantomed crystals. The contrasting greenish Muscovite matrix presents the Fluorites as very three dimensional. The crystals reach over 4.4 CM which is very large for this type, but they still have fine color. In exceptional, undamaged condition, this is a strong, eyecatching display piece. Nothing of this quality has come from Yaoganxian for a few years, these are now considered modern classics and make a fine esthetic addition to any good Fluorite or Chinese suite. A wonderful sculpture of well formed crystals in fine condition. 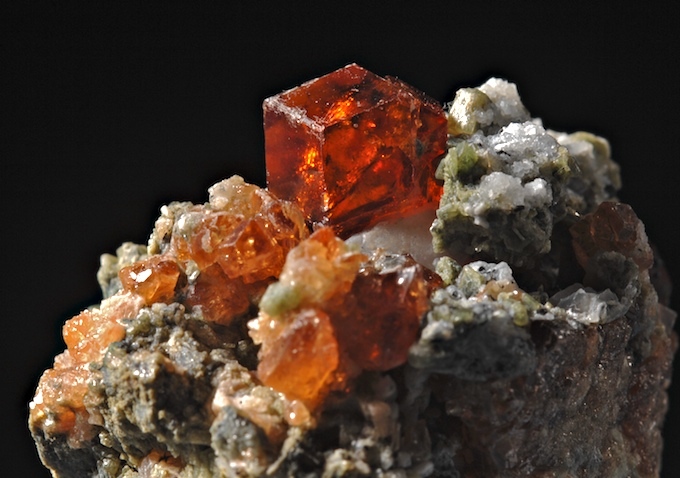 An excellent Erongo specimen that looks great on all sides. 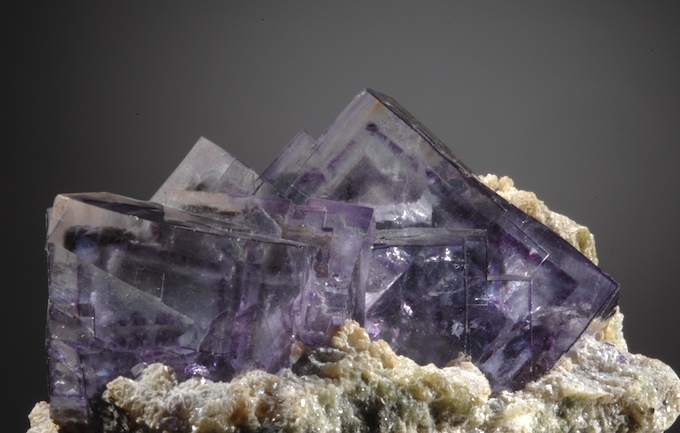 The Fluorites are zoned, complex translucent to transparent purple crystals. 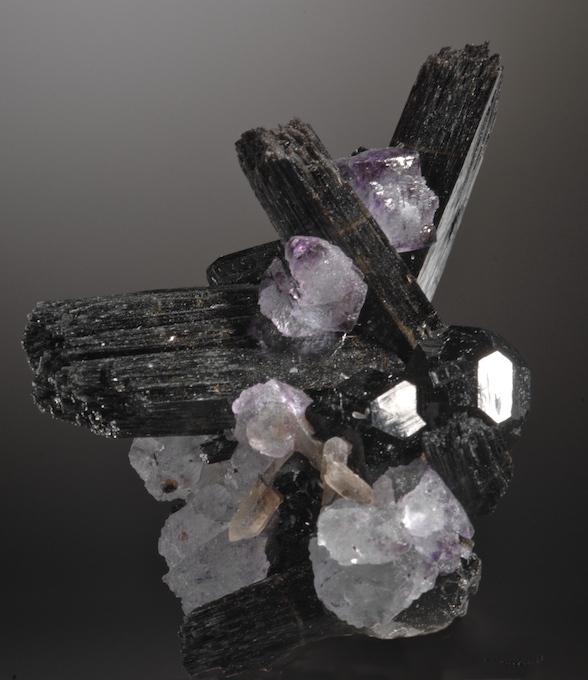 The Schorl is very lustrous and shows several types of terminations. A sprinkling of tiny Quartz crystals adds the final touch. A very good value for the quality.